Vegan Publishers had the opportunity to interview Chris Cooney and Jon Tedd, the delicious brains behind The Vegan Zombie. With over 100 videos, thousands of fans and a cookbook in the making, this is one interview you won’t want to miss! VP: Would you mind explaining the story of The Vegan Zombie? 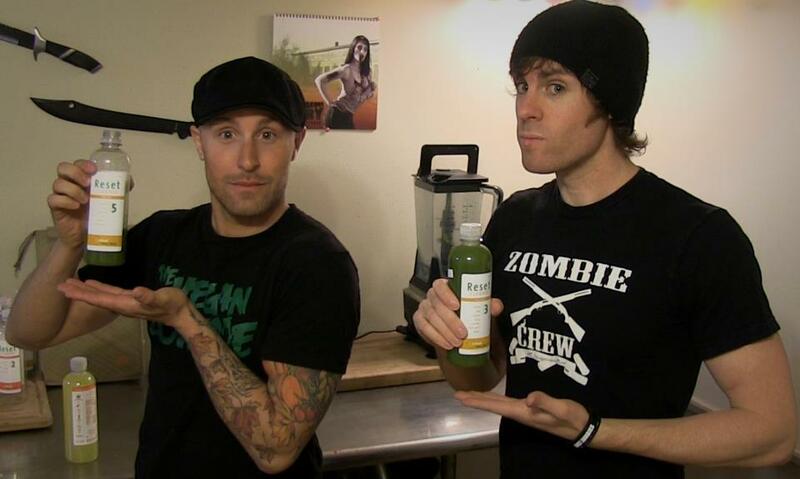 Chris: When I first came up with the idea for The Vegan Zombie, it was actually for the movie, which I wrote the script for. The premise is that there is a zombie infection that is transmitted through animal products that people consume, or if they are bitten by someone infected. The vegans have somewhat of an immunity/resistance to it. In the story, the star figures this out and begins his adventure to find a cure and survive the apocalypse. There may be a twist at the end. I didn’t want to start shooting until I had the time, budget, actors, location and crew to do it right. In the past, I would shoot short videos with friends at the spur of the moment. I wanted this to be a well thought out quality indie short. This is why we’ve held off with filming of the movie. VP: What’s your favorite zombie/horror film? Chris: I’m going to list 3: Romero’s Night of the Living Dead, 28 Days Later (even though some would argue if it’s a zombie flick or not) and recently, World War Z.
Jon: I’m a big fan of 28 Days Later. My friends often argue whether or not it’s an actual zombie film, I like to think of it as a more advanced virus than the traditional zombie virus! VP: What inspired you to become vegan? Chris: I first went vegetarian at the age of 14, initially for the discipline of it. Four years later I went vegan for many reasons. I have always been compassionate towards animals and the more I learned, the more I could not justify eating them. I felt healthier almost immediately and I was more conscious of what I was eating. At that point, I just didn’t consider animal products food anymore. There were so many reasons to be vegan and not so many not to be. It was a no-brainer for me. Jon: I’ve been vegan since I was 15 years old. I started learning more about how animals were treated in factory farms and laboratories. The more I learned, the easier it was for me to make the decision to go vegan! VP: If you could only use one recipe to possibly to introduce someone to veganism what would it be? Chris: Probably our stuffed broccoli and spinach pizza. It’s so delicious and I’ve never had anyone say they didn’t like it. Jon: I would pick our fettuccini alfredo recipe! It’s a simple recipe that doesn’t call for a lot of hard to find products. VP: If you could suggest only one film to introduce someone to zombies what would you recommend? Chris: I would have to go with Night of the Living Dead. Romero is the “Godfather” of the zombie genre and this movie started it all. Jon: I’d say Zombieland. It gives you a breakdown of what you need to know to survive the apocalypse. VP: You are obviously skilled cooks- care to tell us how you learned to be vegan chefs? Chris: I learned to cook when I was young, but it really took off at about 14 when I became vegetarian. I had to figure out how to make my own meals because at the time my parents didn’t support my decision. They do now though, 100%. I also worked at many different restaurants. I would learn how to make their recipes and then go and make my own vegan versions of them. VP: You have such a large, dedicated following. 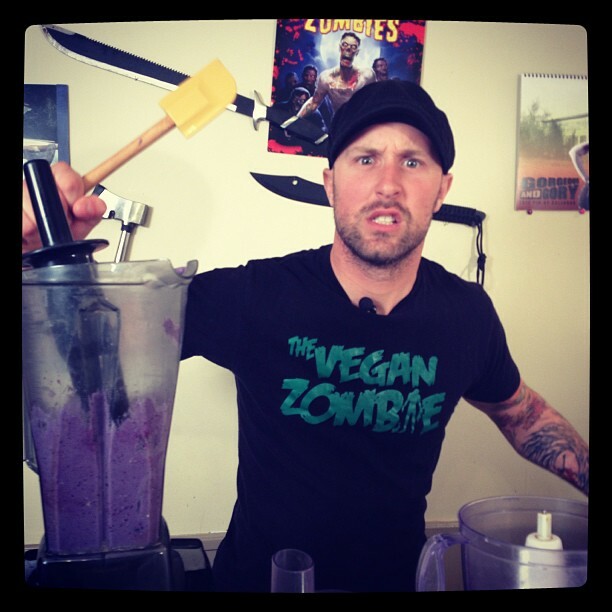 What do you think makes The Vegan Zombie so popular? Describe a typical fan. Chris: We are a fun, entertaining show. We welcome everyone to join in and watch our videos and hopefully try our recipes. We don’t take the preachy approach and we are very engaging with our audience. A typical fan is usually excited to see our new videos and laugh with us and share their posts on our page. Jon: I think that our simple recipes combined with Chris’ fantastic editing and my silliness make it easier for the audience to watch and enjoy the videos! I wouldn’t really call The Vegan Zombie audience “fans.” I feel like they’re more like friends! We really enjoy getting messages from people telling us how we’ve impacted their lives in a positive way. It really inspires us to continue doing what we do. VP: We are all looking forward to your cookbook. Besides the zombies of course, what do you think will set your vegan cookbook apart from the rest? Chris: Well that’s the number one thing that sets it apart. The graphic novel illustrates the adventures of TVZ. We stand by all of our recipes. They are delicious, easy to prepare and always vegan. We intend to design the recipes to be more like a journal from Jon’s adventures and his survival from the zombies. So, you can prepare all the same dishes that we have prepared along our journey and feel rest assured that they are all compassionate towards animals. Jon: We are approaching this project as a graphic novel/cookbook combination. We are trying to entertain the reader with a unique story line, as well as show them how to make simple yet delicious vegan comfort food! VP: Have you been surprised with the success of your Kickstarter campaign? Chris: Extremely! I was reluctant to even do it for fear of not even reaching half of our goal. I cannot believe the success of it. We are so grateful to everyone who has supported us. Jon: I was very skeptical that we were even going to reach our target goal. So, imagine my surprise when we reached it in only eight days! 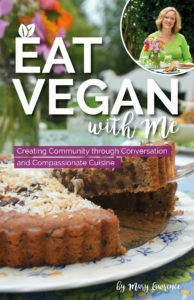 VP: Vegan Publishers always asks our interviewees about their favorite books. What’s yours? Chris: It’s been a while since I’ve had time to read a book. But I would say A Brief History of Time by Stephen Hawking. What can I say- I’m a nerd. Jon: I never learned how to read. I am really excited about their book! Yay! Cheap jerseys from china has the top-notch cheap eindhoven jerseys in various styles and colors for you to choose!we offer a free backup service to customers.